New Delhi/Bangalore: There’s no shame in being stingy. That’s the message employers seem to be uniting behind in communications with their workers. On the cutting block: travel, salary hikes, subsidies on meals. Office supplies such as staples and printer paper are being watched a lot more closely. Autorickshaws might be favoured over taxis again. Some companies say don’t take vacations; others are mandating time off. For workers, the signs all point to the end of what have been generally good times. From gyms to flexible scheduling, companies hungry for talent often plugged their perks. 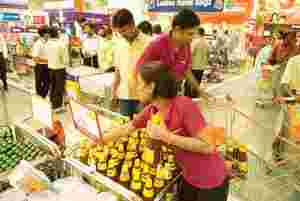 Cost-cutting: Employees (in pink T-shirts) at work in a Big Bazaar outlet at Noida. The retailer’s parent Future Group has launched an internal cost-pruning campaign invoking staff pride in being stingy. With its uniform-clad workers protesting layoffs, airlines have been among the hardest hit—their efforts leading to a dramatic 24-hour firing, then rehiring of 1,900 cabin crew and ground staff at Jet Airways this week. But the scaleback has anecdotal examples across sectors—retail to information technology. Earlier this week, business software solution firm SAP AG told employees to vacation between Christmas and the New Year to save on infrastructure costs such as electricity and phone bills. Winning over employees—especially a workforce skewed young—can take an ad man’s flair. “2,82,000. Do you know what this number means? This is our average print bill. Only 1,60,000 are official," read one technology service company Cognizant Technology Solutions Corp. email informing employees of a new limit of how much they can print: 25 pages per day. Cognizant also took a Rs15 subsidy off its canteen, doubling the cost of a lunch to Rs30. The company declined to comment, citing a silent period before quarterly results due on 5 November. And at the beginning of the year, retailer Future Group launched an internal campaign to cut back on employee expenses. With the slogan “garv se kaho ki hum kanjoos hain“, or proud to be stingy—it sought suggestions on how to reduce travel budgets and paper bills. The company then used tips on everything from sharing cabs to not using staples and adopted new guidelines. “Everyone bought into the idea," says Future Group human resources head Sanjay Jog. Human resources experts have not entirely been taken by as much surprise as workers. From layoffs to hiring freezes to mandating double-sided printouts, they say they are watching market fluctuations with some trepidation and making changes, pre-emptively, proactively. “We’ve been talking about cost management for the last two quarters," says Pradipta Bagchi, a corporate communications manager at Tata Consultancy Services Ltd (TCS), “trying to be more efficient, reduce travel, encourage employees to use video conferencing." Tech company Agilent India reduced salary raises to 5% this year, down from the 10-12% hikes it handed out last year. “We’re just going to be monitoring the economy, and feel maybe by middle of next year the liquidity crunch will be a little more easier," says Venkatesh Valluri, Agilent president and country general manager. Facing a talent crunch and wanting to reward those who worked long, non-traditional hours, many companies have plugged perks as a way to more effectively recruit. Now, they say they are hiring based on need. For job candidates, that means routine delays as they look for work and more uncertainty. One Chennai-based hire at TCS says he got his offer letter last December and graduated in July, but is worried enough about getting his call to report to work that he will take a temporary job at a call centre while he waits. “After college they said each will be getting the mails," the recruit says, speaking on condition of anonymity. “It is a bit slow." TCS’ Bagchi cautioned that workers should not panic. “We hired 22,000 and trainees are batched from June onwards until February," he says. “It happens every year. We haven’t, in any sense, reneged on our offers or delayed joinings." One soft-skills trainer in Chandigarh says she can’t find a job because many companies have slashed their training budgets and don’t need services such as hers the same as before. “Every time I approach a company they tell me they are into cost-cutting and training is the last thing they are looking for," says Shrruty Tomer, who has been on the job market for two-and-a-half months. “The economic crisis is really affecting me."